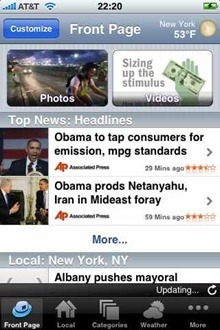 The Associated Press has announced that it’s planning to bring a news app to the iPad. The announcement says that the plan is to charge for the app, though it may start out as free; perhaps they’ll be doing whatever free plus subscription models emerge for the newspaper / magazine industry on the iPad. No word yet on when the app may be released. I like most things about the AP Mobile app on the iPhone – especially the ability to easily add local news in – though I’ve always been disappointed in its push notifications. They’ll be a news app that I’d certainly look at when it hits the iPad.